Lewis Clark and the Essentials album Vinyl Love is one which focusses on journey’s of the past, which most of the lyrics are based on. The style is mostly a sort of rockin’ jazz – body poppin’ groove, with that free-flowing-travelling feel mixed in. The sense that roots are not going to be laid-down until the purpose of the quest has been achieved. Though meeting new people in new surroundings, especially if they’re far away, there has to be a time when these friendships have to break due to the sheer logistics of keeping in touch; which you hear in the emotional way Lewis Clark delivers his songs. Lewis Clark has returned to his home city of Bristol to conquer as he did so well abroad in the exotic surroundings in India and Thailand; both countries have a growing music scene, which are now a global success. 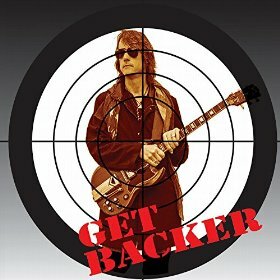 Matt Backer has released Get Backer, which is a great collection of southern blues, boogie woogie and rock ‘n’ roll. As Matt Backer is from New Orleans, the American State of Louisiana, that is oozing with coolness and cultural history from that part of America, which is what it is famed with, does shape his music. A good quality Matt Backer has and is demonstrated in the first two tracks – Histrionic Narcissist Blues (Let’s Talk About Me) and Take Me Back To Abu Dhabi, is a sense of humour. This hip blues song Leaving Trunk (featuring Peter Cox), is sung with conviction and passion about venturing out into the big wide world, and one of the most important thing is singing and playing the blues! This rolling track emulates what a Rock & Roll Headache (featuring Marcella Detroit) sounds like, however by the time this song finishes your headache will have gone. Starting Gun is a great song for those that have had to succeed and find their own path in life, that ain’t easy and you get a sense that you’re not the only one that has travelled this path of disappointment and doubt. Kind of think this song Too Big Too Fail, is obliviously a swipe of the indiscretions of financial manipulation? Though interestingly as the small guy loses his job, house, and everything else, however if you are too big too fail like a bank, you’ll most certainly get a nice pay cheque from the government! Let’s just keep this to ourselves?! This place must be pretty sinful in the House Of Flying Daggers, that has a modern sounding electronic drum beat, and nice echoey harmonica plus an array of guitars, bass and even a mouth Jaw Harp thrown into this song’s loose southern blues, melting creative cauldron. Talking isn’t required or too great effect, but making love is the central plot in this driving upbeat song, Don’t Talk. For two and a half minutes you are pushed through Salt In My Wounds, and made to feel the angst and heartbreak in this more white soul rockin’ sounding track. The percussions comprise of claps and spoons, with slide guitar in this colourful jet-lagged themed tune Hip Fatigue. Finishing off with a blues and boogie woogie number I Don’t Worry About A Thing (featuring Bill Blue & Adam Gussow), is something we either learn or come across with age.